As of January 1, 2015, CRIF Decision Solutions is incorporated as a business line into the parent company CRIF S.p.A. The merger will provide an ever more robust offering of know-how, predictive analytics and technology to enable banks, financial institutions, telco, media, energy and utility firms to achieve sound & optimized decision-making and compliant processes in every phase of the credit cycle. The combination of internationally recognized skills and expertise into a single operation and legal entity enables CRIF to create even more value for its customers, accompanying them towards achieving their goals from strategies to solutions, meeting the needs of global markets in an even more effective, integrated and collaborative way. The new business line, renamed CRIF Credit Solutions with core competencies in Consulting, Predictive Analytics, Risk Management and Credit Management Technology, demonstrates the significant evolution that has characterized the growth and expansion of CRIF Decision Solutions’ mission over time, from decisioning to the end-to-end credit value chain. CRIF Credit Solutions’ value proposition offers an integrated strategy, unlike anything else on the market, which enables its customers to manage credit and risk in a holistic and effective way. 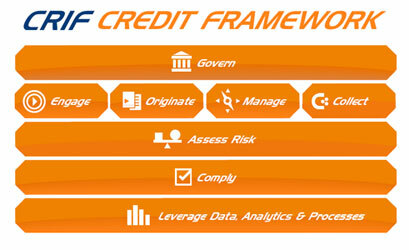 The CRIF Credit Framework is the name given to this value proposition, in which lenders, telco, media, energy and utility firms’ needs for credit value chain and customer management are met with a concrete response in a complete offering of management and methodology solutions dedicated to governance, risk assessment and compliance that have delivered successful results to many customers worldwide. Solutions cover all credit processes: from engagement and origination to monitoring, customer and portfolio management and debt collection. This is possible thanks to a solid international team of professionals, with extensive experience in credit, risk and IT implementation, not to mention the key role of analytics, always core to CRIF Credit Solutions’ rich skill base, which optimizes decisions, extracting value from data coming from all sources such as those provided by CRIF and its customers. It is for this reason that 3,100 lenders and other businesses in 50 countries around the world have chosen CRIF. Today lenders and credit and finance organizations worldwide have to deal with the daily challenges of a market undergoing significant changes, which require a strong balance between the need for control and adaptability towards evolving business dynamics. The ability to provide a concrete response to these challenges and any credit management need, from strategies to solutions, make CRIF an all-round partner, not only for information but also consultancy and advanced technology solutions. This has led to CRIF being included in the prestigious FinTech 100, the important classification on a global level of financial services technology solution providers, as well as being cited by Gartner, Forrester, CEB TowerGroup and other independent research companies, an important recognition of the completeness and robustness of solutions and support offered by CRIF to its customers as they grow.